January 4th, 2014. Creeping behind the pump station next to Mason Wetlands, trying to document the five Trumpeter Swans that had flown in ten minutes earlier. I was not supposed to be at Mason Wetlands. I was supposed to be arriving at my parents' house on Cape Cod around this time, but a blizzard in Boston caused my flight to get cancelled. In an effort to make the best of things, I took the dogs on a walk to the wetlands to work on my fresh 2014 motorless list. Then the swans showed up. These amazing birds had just fallen from the sky on a freakin dog walk. A county bird for me! I wondered, what else could I find on a walk? By the end of January my experiment in motorless birding was made official: for 2014 I would see how many species I could find only by walking. The Marine Drive bike path and I became very close this year. Location is important of course. I live in Parkrose, near the high school, and set my walking boundaries to about six miles from home. 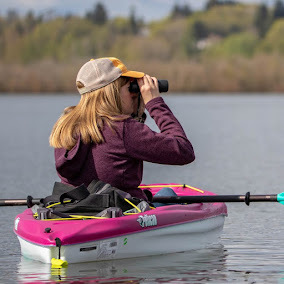 Luckily there are some fantastic spots within that range: Mason Wetlands (13), Mays Lake (36+), the Columbia River, the Columbia Slough and all of its sketchy trails, Whitaker Ponds (4), and Broughton Beach (13). (Number of times visited on walks in 2014). Motorless adventure buddies, taking a break in the rain on a random couch by Johnson Lake. I am ending the year with 136 species and 468 miles under my belt. My full list of species can be seen here, and note that it includes the non-avian creatures as well. Numbers are great and all, I love me some lists, but the best part was the adventure of it all. The discovery of secret slough spots, random lakes, birds in unexpected places. May walk to Mason Wetlands, etc. For the record, this was not any kind of big year attempt, and I still drove plenty. But that's 468 miles that I did not drive. I found one more motorless species than I did in 2013, which is awesome since I rode my bike in 2013. I picked up five county birds while walking this year. Two state birds. One life mammal. You just never know what is going to appear in front of you. As with all birding, sometimes I lost. I couldn't find a Western Wood-Pewee. Or a Marsh Wren. Several times I walked all the way to Broughton Beach without finding anything new. Last week I walked to Mason Wetlands and thought I had found a Eurasian Wigeon. Then Jake started limping and I had to call a friend to pick us up, a little bummed I couldn't count the bird. I tried for it again the next morning and came up empty. Turns out it didn't matter. A closer look at my photos revealed the wigeon was actually a Eurasian x American hybrid. You win some, you lose some, and sometimes you kind of break even. Next year I will resume riding my bike for my list but I am really glad I tried this whole walking thing. It's awesome knowing I can find so many birds and other animals just by setting out on foot. Maybe in 2015 YOU should try a motorless list too! Just sayin! That's great!! New lists are so much fun- even House Sparrows are exciting! This is badass. Well done. I agree. You rock, Jen. Really impressive, Jen! I am jealous of all the cool bodies of water you have nearby. Thanks, Sarah! Water sure does help. Congrats on a successful year. Keep it going in 2015. Do something! I need more bird blogs to follow. Dorian is almost done so I'm not sure who else to follow next year. Thanks, WWBP! I'll do my best in 2015. Awesome work Jen, and you have tossed out a good challenge! I hope some new folks try it! Truly impressive. I always enjoy seeing pictures of your dogs. Birds too, they're almost as cool as dogs. :-) My parents home is in Salem with a nice view of the Willamette. There's something special about seeing a river every day and how it changes over the years. You're blessed to live where you do. It's true, living near the river is one of my favorite things about my house. Thanks for the kind words! You have BAEA in 72 posts? I have them in 7. These are crazy times we live in FJ. Fun fact! Thanks for sharing. Wonderful! I'm inspired to do my own. Thanks for sharing. Love the "I do not want to wait for you to take this stupid picture" look on Jake. Pushing your ears back is a nice touch Jake, keep it up. Yeah, that's pretty much Jake's face in every picture. I should add Ralph seems to be trying to figure out a way to get that couch home. Winner of the Green Blue Ribbon Gold Prize. Storm Wigeon (the hybrid) is perhaps the coolest sounding duck of all, so there's that. Green Blue Ribbon Gold Prize?! Hot damn!